Ivory Coast Struggles To Keep Economy Afloat After Terror Attack Ivory Coast's business community is shaken after a deadly al-Qaida attack on a beach resort. The West African nation's economy had been on the rebound after a civil war. An Ivorian soldier stands guard on March 18, 2016 at the site of a jihadist shooting rampage at the beach resort of Grand Bassam. It's exactly a week since al-Qaida gunmen opened fire indiscriminately on swimmers and diners last Sunday at a popular beachfront weekend getaway in Grand Bassam, the historic former capital of Ivory Coast. Bassam, as the sleepy, pretty town is known, is a short 25-mile ride from the economic capital and main city, Abidjan. Bassam is much favored by local families and visitors, including children of all ages. March 13 was a lazy, sweltering Sunday, as swimmers frolicked in the warm Atlantic Ocean waters, sunbathers enjoyed a day outdoors, and visitors and tourists sat down for lunch at hotels and restaurants overlooking the sea. 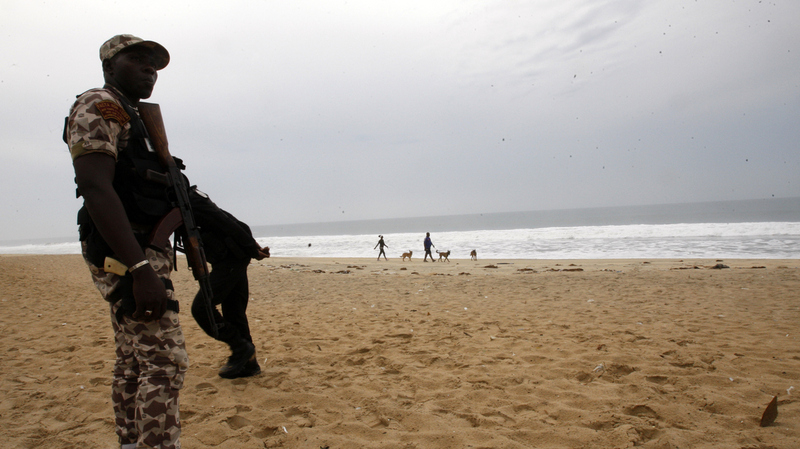 That's when al-Qaida in the Islamic Maghreb, by its own admission, claims its black balaclava-clad militants, toting heavy weapons, first sprayed the palm-fringed beach. They fired in and out of the water before turning their weapons from the beach to the diners. At least 19 Ivorians and foreigners were killed in the carnage. One body, with a bullet to the head, washed up midweek, fueling concern that others may follow. The deadly assault on Grand Bassam was the third in five months in West Africa on a former French colony. Mali's capital Bamako was first in November, with a siege on the Radisson Blu Hotel, favored by foreigners. Then the January siege in Ouagadougou, the capital of Burkina Faso, on the Splendid Hotel and Cappuccino cafe. Foreigners were among the 20 people killed in Bamako and 30 killed in Ouagadougou. Analysts argue that Ivory Coast could have become the latest target of al-Qaida's regional franchise, in retaliation for the country's close relations with Paris. France intervened militarily in neighboring Mali in 2013, leading an offensive to dislodge extremist fighters who had occupied the north for about a year. France retains a military presence in all three countries, with an army and air force base on the outskirts of Abidjan. Now Grand Bassam's Etoile du Sud hotel and other beachside establishments have become the targets and Ivory Coast is reeling. This country, once an oasis of peace, security, stability and prosperity, is emerging from a devastating decade of political violence and a civil war. The economy was on the rebound. The tourist industry is worried. Ivorian President Alassane Ouattara chairs an extraordinary cabinet meeting in the resort town of Grand Bassam on March 16, 2016. President Alassane Ouattara hastened to reassure his compatriots, expatriates and Ivory Coast's international partners and investors. On Wednesday, he took his entire team to Grand Bassam for their weekly cabinet meeting — in solidarity, the president told NPR. "We came to show our sympathy, our compassion to the victims. To their memory, to the families of the victims," Ouattara said. "To show that Côte d'Ivoire will never forget them and that it's important for life to continue." Though he added, "Although we are mourning, we want everyone to know that Côte d'Ivoire is united and that Côte d'Ivoire remains a land of hospitality." 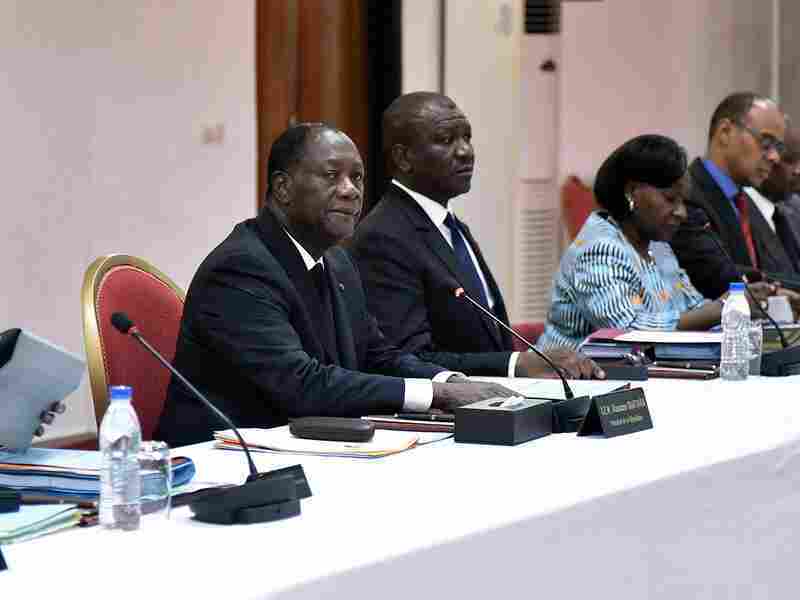 Earlier, Ouattara said Ivorians should not be intimidated by the attacks perpetrated by "cowardly terrorists" and that such actions would not be tolerated. After laying a wreath outside the Etoile du Sud hotel Wednesday, he said Ivory Coast would not allow terrorists to sabotage the country's economic recovery. Over the past five years, Ivory Coast — the world's top cocoa producer — has seen record growth and foreign investment. Tourism was also picking up. Commerce minister Jean-Louis Billon says he doesn't want to overstate the threat to the tourist industry posed by the militant attack. "Of course we're worried," he says. "But, if you look at countries like Kenya or Tanzania, they have been affected in the past and investors didn't leave the country because of terrorism." Billon says it's a collective battle. "No one is safe against terrorism. But we need our growth to develop our country and we won't stop our development because of terrorism." He says Ivory Coast refuses to give ground "to those who want the economy to collapse, because that's what they're looking for." As if to bolster that confidence, potential investors from the U.S. Chamber of Commerce happened to be on a scheduled visit to Ivory Coast just when al-Qaida struck in the deadly assault. The chamber's executive vice president, Myron Brilliant, said the attacks have not put them off. "In no way will that deter our investment and trade relations here in Côte d'Ivoire," he said. "If anything, we feel very close to Côte d'Ivoire," he said, "because we have suffered our own attacks in our country, in the United States. And so we understand what's going on here, we understand the significance of it." Brilliant addressed journalists after talks this past week with the Ivorian president and cabinet ministers on his organisation's wish to promote deeper investment and commercial ties between the U.S. and Ivory Coast. He talked about expanding in areas such as energy, agrifood business, education, healthcare, travel and tourism. "There is a great need, a great opportunity for U.S. companies here in Côte d'Ivoire," Brilliant said. The same has come from Ivory Coast's government, which has shifted up a gear and is full speed ahead after last Sunday's al-Qaida onslaught. The government has announced almost $1 million in immediate assistance to the hotel and transport industries in Grand Bassam, as well as craftsmen and other local businesses hard hit by the attacks. The authorities have also promised to beef up security, with patrols already in place up and down the 10-mile stretch of Bassam's beachfront and beyond. Security reinforcements were trucked in as VIP visitors, including presidents and top officials from neighboring West African countries and from the former colonial power, France, drove to Grand Bassam to lay wreaths in memory of those who perished. 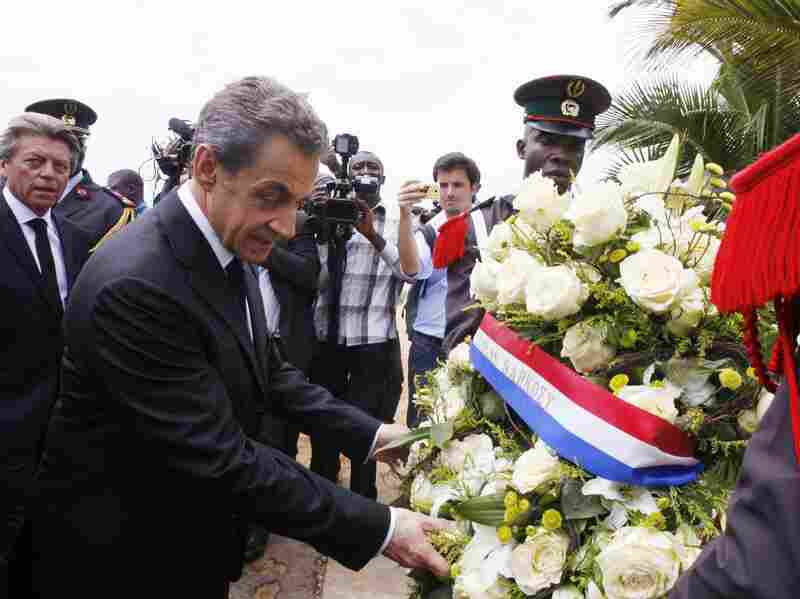 Former French president Nicolas Sarkozy lays a wreath of flowers on March 18, 2016 in homage to the victims of a jihadist attack. Sarkozy was among several dignitaries to visit. The charming town of coconut palms swaying in the Atlantic ocean breeze and elegant, wooden colonial houses, relies heavily on tourism – local and international. UNESCO, the U.N.'s education, scientific and cultural agency, has designated Grand Bassam a world heritage site. The government's new security measures and assistance are cold comfort for Sylvie Kouao, although she thanked the president. Her beach restaurant — right by where the gunmen indiscriminately opened fire on adults and children — remains shut. Kouao, 40, says they had to take cover, as terrified civilians were fleeing and dodging bullets. She has nightmares and is still trying to come to terms with the shock. What's most troubling, says Kouao, is that a male cousin is still missing. They haven't found him in or out of the water. Clutching the hand of her 9-year-old son, Amadou, and stretching her other hand toward the almost-deserted beach, Kouao tells NPR that "life in Bassam is paralyzed. It has come to a standstill." "But we can't just give up," she adds. "We have to stand up. We must not be fearful. We must have courage that life will return to normal." Security forces camp in plastic chairs in front of Kouao's restaurant. Opposite is a makeshift memorial, covered in wreaths. Young men stand around in the shade by the beach, under a marquee erected for VIPs and other visitors who continue to pay their respects. Among the locals with little to do is Abou Lavisse Decky, leader of the local Bassamois musical group, Akanzou. Decky and his fellow singers strike up, a cappella, as mourners approach a growing collection of wreaths. Just a week ago, the singers were serenading diners and entertaining tourists up and down the stretch of seaside restaurants and hotels. Such activities came to an abrupt end during the attacks. Now they're singing lyrics denouncing terrorism. "Non au terrorisme" — "no to terrorism" and "the attacks have robbed us of our jobs." Decky says, "I come here to sing today for the memory of the people who died. I sing for them, because terrorism is a bad thing." As the group sings, "yako!" which simultaneously means "sorry" and "courage," Decky implores Ivorians and foreigners to take heart, have courage and return to Grand Bassam. Pointing to the empty beachfront, Decky tells NPR, "If the beach is closed, the economy of Grand Bassam is closed. I will come back to sing with my group. It's my job, it's my job," he repeats in desperation. "I haven't another job. So if I don't come to sing, how can I have money to eat?"